he advent of the portable battery-powered computers and improved video processing technology made possible the Portable Movement Analysis System for field or non-laboratory settings. 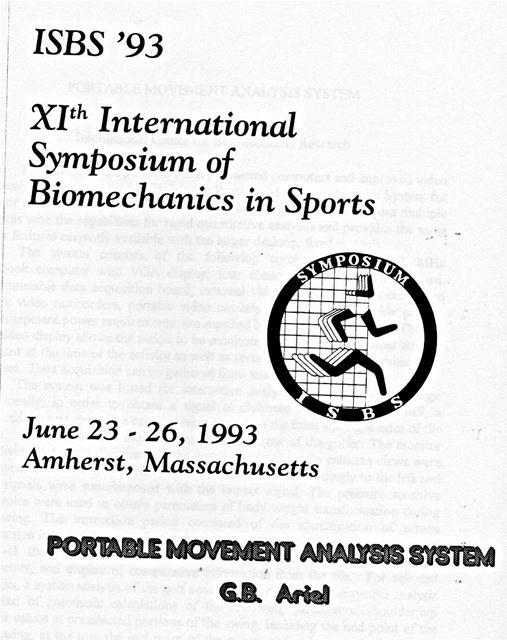 The advent of the portable battery-powered computers and improved video processing technology made possible the Portable Movement Analysis System for field or non-laboratory settings. This system allows visual feedback from multiple cameras with the capabilities for rapid quantitative analyses and provides the same major features currently available with the larger desktop, fixed systems. The system consists of the following -components: 80486/33 MHz notebook computer with VGA display, four channel image processing board, programmable data acquisition board, external video monitor, remote controlled 60 Hz video camcorders, portable video cassette recorder, and portable printer. The equipment power requirements are supplied by rechargeable supplies. The online video display allows the action to be monitored by both the performer and the operator at the time of the activity as well as recording the motion for subsequent analyses. Data acquisition can be gathered from analog inputs. The system was tested for interactive analysis of outdoor golf swings. Additionally, in order to obtain a signal at clubhead contact with the ball, a triggered tee was used. The cameras were placed on the front and right sides of the golfer. An external VGA monitor was placed in front of the golfer. The monitor was divided into four divisions. In the upper two screens, the cameras views were displayedf In the bottom screens, the foot pressure correspondingly to the left and right signals were superimposed with the impact signal. The pressure sensitive shoe soles were used to obtain parameters of body weight transformation during the swing. The instruction period consisted of the' identification of screen information indicating, on the digitized stick figure, the points of interest following the 3-D transformation, the determination of angular and linear kinematic parameters, and display of comparative information from the file. For selected attempts, a system analysis of the golf swing was performed. 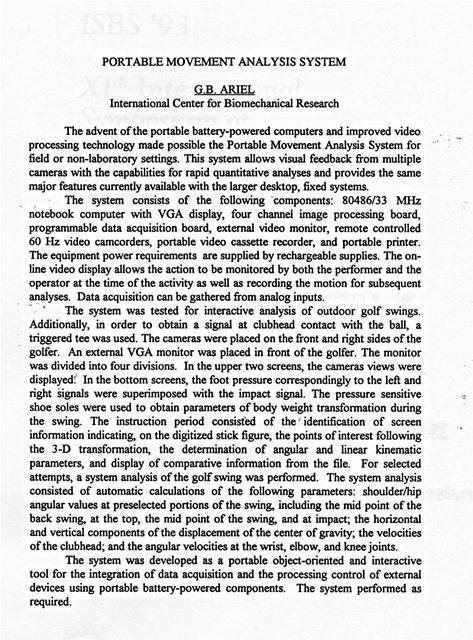 The system analysis consisted of automatic calculations of the following parameters: shoulder/hip angular values at preselected portions of the swing, including the mid point of the back swing, at the top, the mid point of the swing, and at impact; the horizontal and vertical components of the displacement of the center of gravity; the velocities of the clubhead; and the angular velocities at the wrist, elbow, and knee joints. The system was developed as a portable object-oriented and interactive tool for the integration of data acquisition and the processing control of external devices using portable battery-powered components. The system performed as required. Generated on 4/25/2019 11:26:16 AM (PST) ADI/HQ/GBA/2019/ARIELCLOUD/v3.0.2018.0126.